This week's Sweet Melissa Sundays (SMS) recipe was chosen by Cristine of Cooking with Cristine: Apple Orchard Pecan Crumble. I love anything with baked apples, so I was excited to try this recipe. I don't usually like nuts, so my Apple Orchard Pecan Crumble was just an Apple Orchard Crumble :) I thought about adding in oats in place of the pecans for the texture, but in the end decided just to omit the nuts. I was worried my crisp topping wouldn't quite turn out but in the end it was just fine. Most crumb toppings require you to cut the butter in, but in this recipe you add melted butter. This made it really easy, but I was really doubtful that this would work. Lo and behold, though, my crumble came out of the oven with a nice, crisp, sugary topping. This crumble was delicious, even without the pecans in the topping. 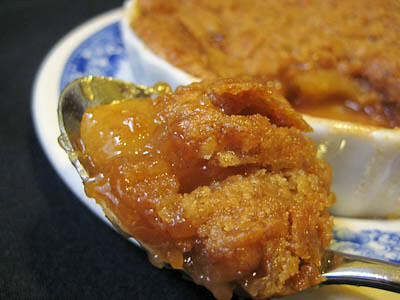 The topping was crisp and had a nice caramelized sugar taste thanks to the brown sugar that is in it. I have to say that the apple filling was a little sweet for my taste (and I rarely if ever say that! ), so I would recommend halving or even omitting the sugar next time. Thanks Cristine, for choosing this recipe. I will definitely be making this one again. If you would like the recipe, you can find it here. Make sure you visit the SMS Blogroll to see how everyone else enjoyed this wonderful fall treat! 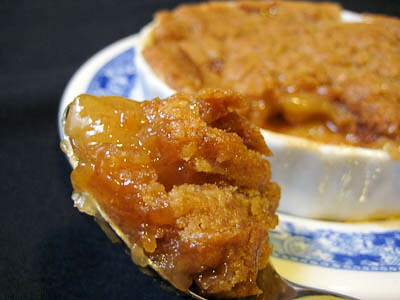 - I halved the apple filling recipe and used 3 shallow creme brulee ramekins. I made the full topping, recipe, however, and it seemed just right - so if you make the full apple filling, I would double the topping recipe. - Either omit the sugar or only one 1/2 cup sugar in the apple filling, otherwise it's a bit too sweet. Also double the cinnamon, it's better that way! - If you make smaller portions, bake for about 45 minutes instead of 1 hour 20 minutes (closer to 1 hour if your ramekins are deeper). - This dessert freezes well. The best way to do this is to put it all together, wrap tightly, and freeze it unbaked. When you are ready to bake, pull it from the freezer, loosely tent it with foil, and pop it in the oven. Remove the foil about halfway through baking and bake until the juices are bubbling and thick. I agree with making the full crumble with half the apples. I did half to both and regretted it after first bite. Your first photo is so luscious! Great tips! Hi Jaime! Your crumbles look great! I omitted the pecans too and I wound up subbing for them but I did briefly consider just leaving them out. Glad to hear it worked out well that way. I made minis too and cut back on the baking time. I had a few really small ramekins that I only baked for around 30 minutes. The bigger ones I did about 45 minutes, like you. Oh, I really wish I had doubled the crumble topping! Yours looks absolutely lovely, and might look even prettier without the pecans since it's just a nice, caramelized top. Great job! Looks good without the pecan, but I liked the crunch of the nuts. YUM! That apple crumble look so good Jaime.. I usually leave the nuts out too. Your ramekins are beautiful! The dessert is perfect for fall. What a perfect treat for this time of year. atta girl--if i had my way, i'd always double or triple the topping. that's my favorite part, and this batch looks lovely. nicely done! Your crumble looks so incredibly moist. Great job. It looks delicious! Out of habit, I normally cut back sliughtly on the sugar in pie/crumble recipes and it seems to work out. Fruit is so sweet on its own, sometimes it doesn't need a whole lot extra. I forgive you for not adding nuts! :) I do think your idea of adding oats a good one. 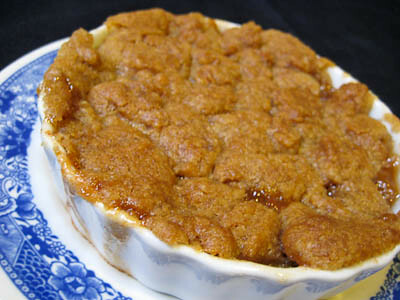 Your crumble looks terrific, glad you liked it! I was also pleasantly surprised about the melted butter, so much easier! i halved the apples and kept the crumb topping the same and i also found the apples too sweet!! so i'll be halving it next time if not cutting it down to 1/4 of a cup. beautiful crumbles!! Thanks for the tips. I enjoyed this as well. Beautiful crumble!! I left the sugar out of the apples entirely and it was still plenty sweet. I can't even imagine what it would be like with a cup of sugar... 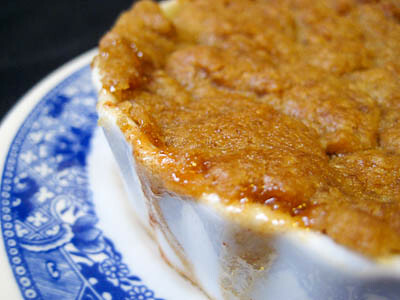 I love the method of melting the butter for the crumble too, so easy! Even though I'm a nut gal, your crumble looks great without nuts. This was super-delicious.